Highly capable but not overly features-laden. 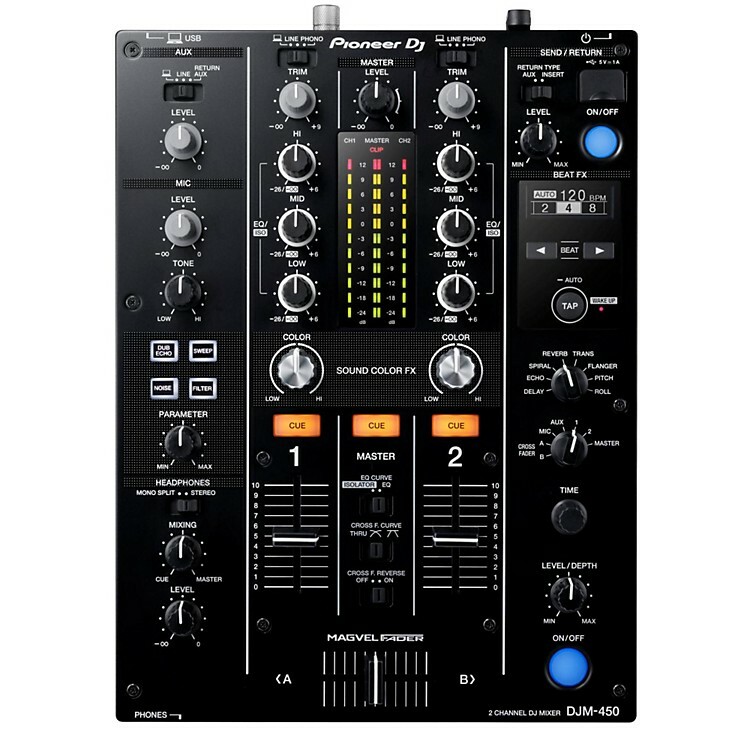 This DJM-450 is a 2-channel mixer ideal for partnering with any multiplayer or turntable pair. The Magvel fader combined with smooth EQ and channel fader curves give an assured feel to mixing and a first-rate audio quality. The DJM-450's connectors and the chassis all speak to Pioneer’s traditions of build quality and component reliability. And thanks to the 64-bit digital signal processer, you’ll enjoy high-quality audio from analog and digital sound sources. The XLR terminal and gold-plated RCAs deliver premium sound quality on all connections. And the signal GND terminal easily attaches ground wires from analog turntables. Plus, you can use a microphone and the AUX input at the same time. The DJM-450 also comes bundled with license keys for rekordbox dj and rekordbox dvs, so you can DJ with tracks stored on your PC/Mac when using turntables and control vinyl (available separately). The EQ lets you balance the high, mid and low frequencies on every channel. Choose your preferred EQ level or use the isolator to totally eliminate each EQ band for the perfect mix. Robust Magvel Faders ensure smooth control over long-term use. Two metal shafts support the fader knobs, while the contact-free magnetic system is designed to endure millions of performances. You get a free rekordbox dj licence key bundled with this mixer. Simply activate your licence key for our DJ software, connect to your computer via USB, and start DJing. Use built-in FX and external FX from mobile apps at the same time. Simply connect your smartphone or tablet via USB to engage instrument and FX apps. Dimensions: 9.1 x 4.25 x 12.6 in. Rugged chassis, quality connectors, musical EQ, great-souynding effects and more. Order today.